Drinking water is something every person does daily. If you are like me, you probably drink six glasses of water daily to keep refreshed and well hydrated. If you are not doing this, then you may be in serious trouble. You see, keeping our body hydrated is important to our health. Also water brings many benefits to our oral health. You will be surprised how much water helps our teeth to look nice beautiful and healthy. Keep in mind that our body is made mostly of water. This is more than a valid reason to drink lots of water every day to replenish the water in our body. As you may know, we lose tons of water along our day, so we can dehydrate very easily. Without enough water in our body we can struggle to do simple activities such as moving and even thinking. It is such a waste to not drink enough water because you are missing so much. Water has great effects in our body, directly to our skin, hair and teeth. Drinking lots of water helps your body to stay cool and hydrated, helping absorb and distribute nutrients. Here at Dental Solutions in Los Algodones recommend our patients to drink 6 to 8 glasses of water a day so they can keep their mouth clean. By drinking enough water you can keep your mouth nice and clean from bacteria. A glass of water after every meal can help to wash down some of the food debris. This will make extra easy to brush your teeth afterwards and using floss to clean them. Remember to use only water for this, as juices and sodas contain acid which can damage your teeth and favors plaque buildup. Another great point is that water is calories free. You won’t have to worry about gaining weight by drinking lots of water. In fact, it can help you to reduce weight and slim down, especially if you exercise often. So avoid sugary drinks and say yes to gallons and gallons of water! 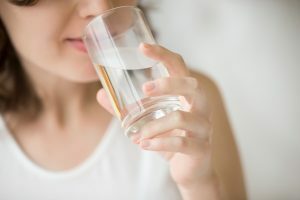 Some dentists recommend to drink water with fluoride. This is a good idea to fight cavities and gum diseases. Fluoride also is very good for your tooth enamel which is a coat that protects it from bacteria. This way you can be sure that your teeth will be strong and healthy. Just remember to keep a good dental hygiene to avoid what I mentioned above. One of the most important points when we talk about hydration is dry mouth. Having a dry mouth can be very damaging for your oral health as it can affect you tongue, your gums and even your teeth. The key to all this is saliva. Water is important for our body to produce enough saliva to keep our mouth moist and nice. Keep in mind that bacteria grows easier in warm and dry enviroments. But that is not all, saliva is great for our mouth and teeth. Even if some people find it gross, saliva helps our teeth to stay away from bacteria. It even reduce the amount of plaque. Saliva is also good for your teeth enamel, so keep drinking lots of water to keep your smile nice and wet. That is all for today, I hope these tips serves you well. Remember to visit you dentist at least twice a year for regular cleaning and checkup. And if you want top quality dental with nice prices don’t be shy and hit us up at Los Algodones. Dental Solutions at your service!